This blog contains spoilers for the Solo: A Star Wars Story expanded edition novelization by Mur Lafferty. Star Wars is a plethora of content nowadays, and from the looks of it, I’d say that isn’t going to change anytime soon. And why should it? Better yet, let me rephrase that, why would we want it to stop? To put this into Star Wars terms, Star Wars has had its “restraining bolt” removed. Meaning, with Disney and Lucasfilm working hand-in-hand, Star Wars has nowhere else to go but to grow. And that should be a good thing, right? Right. Speaking of growing, Solo: A Star Wars Story may be a prequel film, but it didn’t just “go back,” it catapulted the galaxy far, far away forward. What I’m trying to say is that it enriched a story we already knew and its origins. So much so that it erupted into a snowflake or domino effect of possible story directions. Again, like removing a restraining bolt from a droid, Solo: A Star Wars Story liberated (from a certain point of view) the storylines in Star Wars. In other words, there are so many different directions and story angles one could take after Solo: A Star Wars Story. For instance, Beckett and Val, or Qi’ra and Maul. Heck, there’s even the crime syndicates like Crimson Dawn and the story behind Dryden Vos. And for those that dug deeper by turning the pages of the Expanded Edition by Mur Lafferty, well, there’s a whole tale to be told about Saw Gerrera and Enfys Nest. But, I digress. As I said above, Star Wars is growing and as it grows, so does its universe, and the people or living beings in it. That said, this is the preface of my topic today. Meaning, throughout the generations of the galaxy far, far away, our heroes, and heroines have moments that hold them back from progressing forward. These moments can vary from their personal opinions on situations or can be blatantly obvious within the story itself. Otherwise speaking, what’s their restraining bolt? For starters, let’s begin with Luke Skywalker and when we first meet this sandy-haired, blue-eyed teen in Star Wars: A New Hope. He wants off of Tatooine so bad he can taste the salts of the sand. Because, well, “if there’s a bright center to the universe, you’re on the planet it’s farthest from,” if you happen to be on Tatooine. Luke dreams of becoming a pilot. But first, he must join the Imperial Academy. And that’s where the restraining bolt comes in, Aunt Beru and Uncle Owen. Uncle Owen insists that Luke stay on the farm for another season, but is that the real reason? Perhaps, Uncle Owen, like his step-brother, has an issue with letting go. Like Anakin, Uncle Owen might be afraid to let Luke get his feet wet, so to speak, and that if Luke is out of his reach, he won’t return to the homestead. Expounding upon that notion, Owen could be afraid that something terrible could happen to Luke while he’s away that would prevent him from ever coming home again. After all, Anakin never returned and instead, a robed stranger delivered his son to Owen and Beru, Luke. Wow, now that’s a double whammy for the price of one. Moving along, next up are Qi’ra and L3-37 from the most recent installment of Star Wars, Solo: A Star Wars Story. If I may be frank, these two ladies are the inspiration for my musings today. Ok, to be fair, credit should go to Lawrence and Jon Kasdan, and Mur Lafferty for writing these women in their scenes so awesomely. So, literally and figuratively, Qi’ra and L3 are probably the best examples for my topic, and no, that’s not to be demeaning towards droid rights. To be honest, quite the opposite. So, getting back to Solo: A Star Wars Story, there’s a private moment between Qi’ra and L3 in the cockpit of the Millennium Falcon. The beauty of this scene is the irony. L3-37 with her, “take no crap” personality comes across bold, and out-of-left-field when she points out Qi’ra’s so-called “little problem.” Putting it simply, L3-37 may be the droid, but Qi’ra’s the one with the restraining bolt. Oddly enough, in that scene, Qi’ra seems to be reeling. You can see her questioning, wondering if L3-37 can pick-up on it, who else can see her weakness? You can see a fear setting-in as she contemplates Han’s love for her and her ties to Crimson Dawn, and Dryden Vos. In essence, L3 has more rights than the human woman sitting next to her. More freedom. 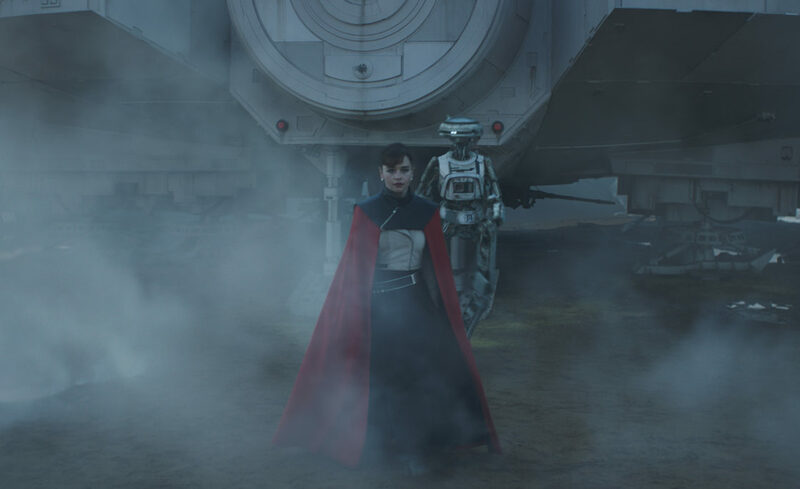 The irony is, Qi’ra is the one who is held captive by an organic overlord, and because of those chains, she will never be free to go anywhere she wants, and she’ll always have to take orders from somebody else because, in her experience, everyone serves someone. Contact Becca at beccab@coffeewithkenobi.com and on Twitter @urangelb. The novelization really was very good!